The British Antarctic Expedition 1910-13 or Terra Nova expedition as it became known was a far reaching and ambitious programme of scientific research and discovery best known for the ultimately fatal attempt to reach the south pole by Scott, Bowers, Evans, Oates and Wilson. Built originally for the Dundee whaling and sealing fleet. Barque / 1 funnel, 3 masts / L,B,D 187' x 31.4' x 19' - 57m x 9.6m x 5.8m / 744 tons / Hull: wooden / Compliment: 65 / Engine: 140 nhp, 1 screw / Built: Alexander Stephan & Sons Ltd. Dundee, Scotland, 1884. 1903, sailing with fellow Dundee whaler "Morning" to relieve and help free the Discovery from McMurdo Sound. 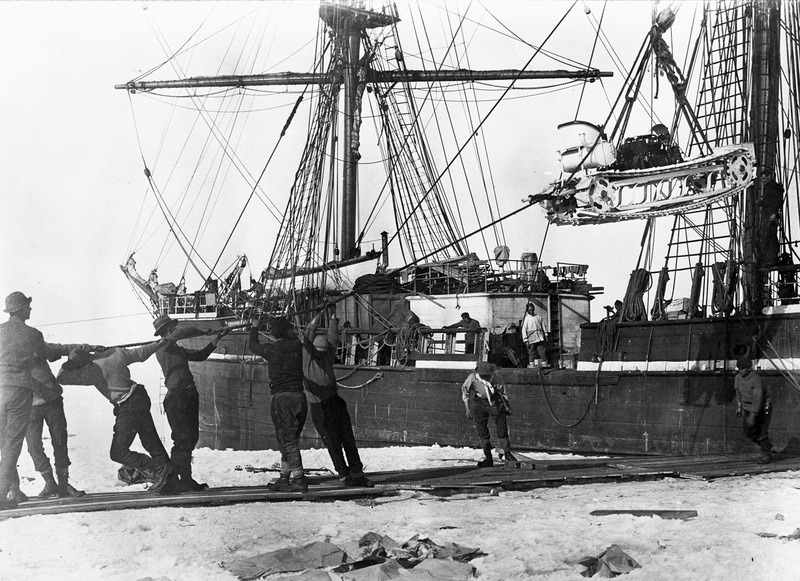 On her return from the Antarctic in 1913, the Terra Nova was re-purchased by her former owners, Messrs. C. T. Bowring and Company to return to work in the Newfoundland seal fishery. She met her end on September 13th 1943 when she sprang a leak and foundered off Greenland, the crew all being saved by the coastguard. 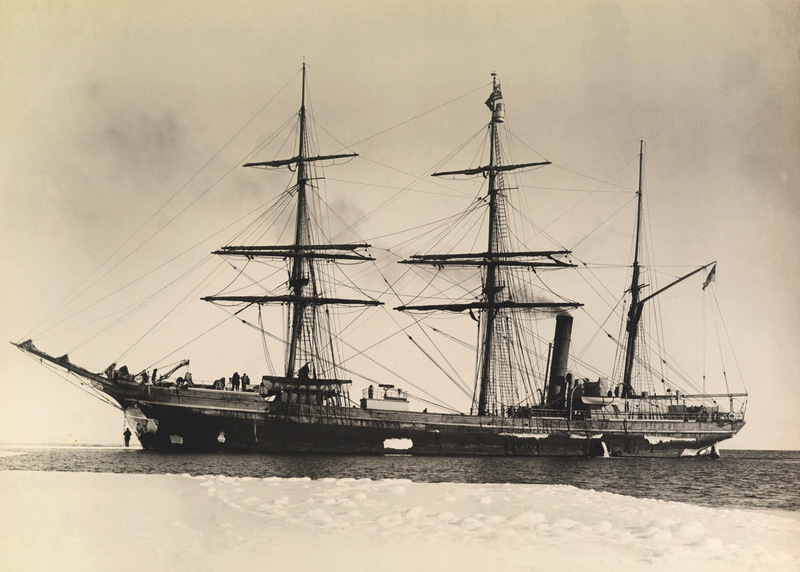 The Terra Nova (Newfoundland in Latin) had worked the arctic and sub-arctic seas proving her worth for many years before she was called upon for expedition work. She was purchased for the British National Antarctic Expedition in 1910 for £12,000 a second choice after Captain Scott was unable to obtain the Discovery built especially for his earlier 1901-1904 Antarctic Expedition and now owned by and working for the Hudson Bay Company. The Terra Nova however was a bargain particularly compared to the £50,000 that the Discovery had cost ten years earlier. "a wonderfully fine ice ship.... As she bumped the floes with mighty shocks, crushing and grinding a way through some, twisting and turning to avoid others, she seemed like a living thing fighting a great fight." She was however 25 years old by 1910 and had a tendency to take on water above and below the waterline. Time spent at the bilge pumps was a constant necessity for the crew throughout the voyage. Leakage through the supposedly caulked main deck during rain or rough weather continually dripped on those below, the worst position in this regard being for those under the stables. The final port of call for the Terra Nova before setting off for Antarctica was Lyttleton in New Zealand. Here she was placed in dry dock to find a leak that kept the crew and bilge pumps in almost constant motion since leaving Britain. Once afloat again, amongst other stores, 19 Manchurian ponies a token dog pack of 33 animals and three expensive motor sledges were loaded aboard. She was dangerously overloaded when she sailed for Antarctica and indeed came close to being lost in a storm at latitude 52° South. Great seas washed again and again across the ship's deck loosening sacks of coal and crates of petrol for the tractors. The crew repeatedly waded across the deck to retrieve and make fast the moving cargo that was battering around causing more damage as it did so. Many sacks of coal were simply thrown overboard. One of the dogs (Osman) was washed overboard only to have the next wave wash him back again, another poor animal was not so lucky. The water washing across the decks found its way into the engine room and coal bunkers, the fires were put out in the engine room and coal dust was washed into the bilges. Here it mixed with oil from an earlier spill and formed a thick slurry that clogged the bilge pumps. Access to the bilge pump intake was through the main hold, but had the hatch been opened in the storm, the ship would surely have sunk through the water taken on. While all hands bailed, the engineers pierced two bulkheads, one wooden, one iron, to reach the bilge intakes. Bowers entered the hold and diving through water and muck, managed to clear the valves, those on deck at the pump handles cheering when the outflow pipe spewed forth the bilge contents once again. Apsley Cherry-Garrard. A friend of Wilson, the expeditions Zoologist who had paid £1000 by contribution to join. "Cherry" as he was known was a young recent graduate, and at 24 the expeditions youngest member not really qualified for anything - though he became an invaluable expedition member. His book "The Worst Journey in the World" has been widely acclaimed and regarded by some as the finest travel story ever written it has been in continuous print since 1922. Herbert Ponting. The expedition camera man and photographer. Ponting was a highly skilled and accomplished photographer and artist, some of his pictures and his film are still regarded as classics today. The Terra Nova entered the pack on December the 9th 1910, progress was slow as the ice was heavy, much valuable coal was consumed in forcing a passage through it. "The Terra Nova proved a wonderfully fine ice ship. 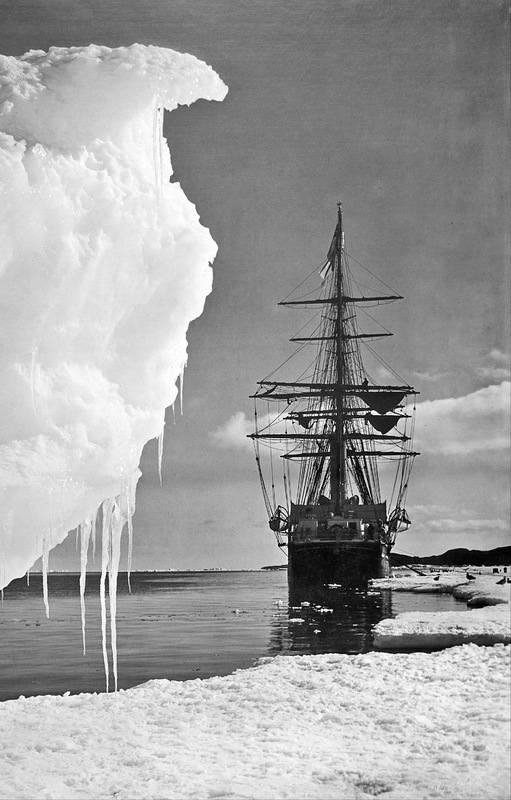 Bower's middle watch especially became famous for the way in which he put the ship at the ice, and more than once Scott was alarmed by the great shock and collisions which were the result ............ But Bowers never hurt the ship, and she gallantly responded to all calls made on her". The ship behaved splendidly - no other ship, not even the Discovery, would have come through so well. Certainly the Nimrod would never have reached the south water had she been caught in such pack". Eventually the Terra Nova reached McMurdo Sound but couldn't get as far south as the Discovery had due the heaviness of the pack ice. She stopped near a place re-named Cape Evans (formerly the "skuarry" after the birds that nested there) to unload and establish camp. Even here she had to be unloaded over a mile off shore and all the supplies dragged across the ice. It was during this unloading that one of the motor sledges broke through the ice and sank, lost to the expedition forever. In early February the Terra Nova steamed into the Bay of Whales on a last exploratory mission before returning to New Zealand for the winter. Here she met two dog teams of Amundsen 's expedition who were out for the day unloading cargo from the Fram. Three from the Terra Nova went to the Norwegians camp , Framheim for breakfast and later in the day, the Norwegians lunched aboard the Terra Nova. After dropping supplies off back at Cape Evans and unloading two ponies (that had to swim ashore) the Terra Nova left for New Zealand. The next time the Terra Nova sailed into McMurdo Sound in 1912 to re-supply the expedition, Scott and four others would be away on their attempt at reaching the South Pole. In 1913 when she arrived to bring the explorers back, the landfall was traumatic in a way that had never been anticipated. The wardroom table on Terra Nova was set for a celebration reunion dinner. The ship was spotted from the shore and the usual maritime greeting "Are you all well" went out, the shouted response delivered the dreadful information. Two days later Cape Evans had been abandoned and all were on board and heading back to New Zealand.